We’ve been getting a lot of requests for heated work gloves lately so we’ve made it our mission to find the best possible pair on the market. In the past we’ve recommended that people just buy a pair of thin heated liners to wear underneath their regular work gloves but that’s because we hadn’t come across a great pair of heated work gloves yet. That has changed now that we’ve found the Volt 7.4 Heated Gloves. As I said before, we’ve been getting a lot of requests for heated work gloves. I’m really glad that people have been asking me about this because there are some really great options and I’ve been looking forward to reviewing some of them. The Volt 7.4V work gloves are my top pick for any industrial or heavy duty type of application. They’ve been able to take a lot of abuse whether it’s sharp objects or power tools, we’ve put them through the ringer. Asside from being able to withstand harsh environments they’re also great at keeping the hands warm and dry. With the output of 150 degrees fahrenheit they’ll keep you warm even on the coldest days. You may have read my other Volt reviews here at The Warmest Gloves. I have had quite a bit of experience with the Volt brand over the years and I’ve always been impressed. Since I don’t work in an industrial environment I thought I’d approach my friend Tom and ask for his help with the assessment of these gloves. Tom works in a lumber yard which is mostly outdoor work. He’s constantly handling heavy lumber as well as using plenty of hand tools and operating heavy duty equipment. Fortunately he was kind enough to help me out with this. He was actually pretty excited at the idea because he’s never worn a pair of heated gloves while at work so this was new to him. He has experience with recreational heated gloves though, as he owns a pair of the Outdoor Research Lucent gloves and he’s very happy with those. We waited for a day where the forecast was predicting cold temperatures. Then I gave him a list of some things to take note of. I wanted him to wear them for at least two days so that we could get an accurate assessment of them. This of course would only be possible if he liked the gloves enough to put up with them for a second day. After his first day wearing them I was a little nervous that he might not want to wear them for a second day but fortunately he liked them and was more than happy to keep wearing them. Tom put the gloves on right in front of me so I could witness his initial reaction to the comfort of these gloves. Right away he said they felt good. He said they’re soft but strong feeling at the same time. He said they felt a lot like his OR Lucent gloves but slightly stiffer. I’m not surprised by the fact that these gloves are a little stiff. Most warm gloves will feel a little stiff, especially when they’re brand new. But being work gloves, these ones have extra protection and padding in the more common wearing spots so that they can last in the harsh work environment. This will no doubt make them a little stiff. Like all gloves, the stiffness will diminish as they get worn in. After his first day of wearing them he had some good feedback. He said they were overall great. He loved having the extra heat and he said that they provided a very soothing heat that went all around the hand, not just the palm or fingers. The exterior of the gloves are made mostly of leather and the interior has a fleece lining which gives them a nice comfortable feel. He said that they were bulkier than his usual work gloves and this was to be expected. He said there were times when he had to take them off to handle smaller objects which I guess means that they could be better in terms of dexterity. As for warmth, he raved about them. He started with them at the highest of 4 heat settings. After about 30 minutes he had to turn the heat down and this was on a day that the temperature dropped down to -4 Fahrenheit/-20 Celcius. He said that he settled into the very lowest temperature for most of the day, turning them off for his lunch break and coffee break. As for the score, I’m giving them a 17/20 for comfort and a 19/20 for warmth. Since these gloves are fitted with an Aquatex lining, they did really well in the water resistance department. The lining is 100% waterproof and breathable so he didn’t have any issues with wet hands. Tom’s second day of work was quite a bit warmer which wasn’t great for the warmth testing but fortunately the previous day was cold enough for us to get a good idea of warmth. What the second day did provide us with was a little bit of moisture. It was snowing off and on throughout the day and it was heavy wet snowflakes which made for a sloppy lumber yard. This was the perfect environment to test the water resistance of these gloves. By the end of the day Tom’s hands were still bone dry. We were please to see that no water made it through the membrane at all. He spent a good portion of the day handling wet objects which really tested the gloves. Although his hands and the inside of the gloves were dry, the leather palms of the gloves had absorbed a bit of water. This isn’t a huge surprise as we all know leather tends to do that. What this did was make the gloves slightly less comfortable and the dexterity suffered just a little bit. Not a big deal, but something to take note of. I’m still happy with the results of this category and I’m giving them a score of 18/20. I already know that these gloves will be very good quality simply because they’re Volt and I’m familiar with this brand and they have a great reputation in the industry. With that being said, these gloves will be held to a slightly higher standard just because they are work gloves so they’ll need to be even more durable than most. After Tom’s second day of work wearing these they didn’t look any worse for wear. Aside from the fact that they were dirty, they were in great condition. Now I know that this doesn’t give us an idea of what they’ll be like after an entire winter season of work so we’ll have to make due with what we’ve got. I inspected the gloves closely to get an idea of just how well built they are. The have a nylon outer layer with extra leather in the common wear and tear areas. You can feel the strength of them when you handle them and inspect them. I have no reason to think they wouldn’t hold up well under regular abuse. I can see that when compared to other heated gloves they are much more padded and they offer a lot more protection for the hand. Knowing what I know, I’m going to give them a 19/20 in this category. This glove comes equipped with the exact same battery as the Volt Tatra that I reviewed. They come with two 7.4V 2200mAh lithium-ion batteries and a duel charger so you can charge them both at the same time. Just like the Volt Tatra’s these gloves have 4 different heat settings. This is a little different because most gloves only have 3 settings so Volt steps it up in this category. The factory says these will get 2+ hours of heat on the highest setting and 8+ hours of heat on the lowest setting. As with most gloves, the real life results are slightly different than what the factory says but fortunately these ones weren’t too far off. Here’s what Volt claims they get. Tom’s results were not too far off and he was still quite happy with the results. He was able to get even more time on the highest setting. He said they lasted 2.5 hours. On the lowest setting however he said they only lasted 7.5 hours. These results will vary depending on a few circumstances. One thing to remember is that you don’t usually need to have them at the highest setting. Often you can switch between the lower settings and this will extend the life a great deal. Personally I’ll switch between having them off and the medium setting. This has always been warm enough for me with Volt gloves and it helps stretch out the life of the battery. I’ve read a few threads and forums online where people are complaining about the battery life of these gloves. You have to take all of these with a grain of salt because you never know how people are treating them. They might be failing to charge them fully before starting out. Who knows, all I can go on is mine and Tom’s results which were pretty decent. I’m giving these a 15/20 in this category. You’ll probably find that these gloves fit a little small. Both Tom and I discovered that we needed one size larger than we normally wear so it’s a good idea to order one size up. You can always refer to our Sizing Guide to be sure you know your own measurements. I have to say that I’m not only impressed with these gloves but I’m also really excited that Volt decided to make a pair of heated work gloves. These work gloves are not only durable but comfortable as well. I wouldn’t be surprised if some people decide to buy these as their everyday winter gloves because they are a good all round pair of gloves. For anyone who does work outdoors in the winter months you’ll definitely want to take these into consideration. They can really make a long miserable day of work more bearable. As I’ve mentioned before, we often recommend people buy a pair of heated liners and just wear them underneath their regular work gloves in order to get that extra warmth. The reason we’ve said this is because there hasn’t been a great alternative. Now that Volt has come out with these everything has changed. There is now a good option and I won’t be surprised if this results in even more options on the market going forward. Please feel free to leave any questions or comments in the box below and I’ll be sure to respond ASAP. Also if you’ve tried these gloves I’d love to hear about your personally experience with them. 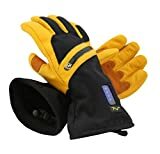 Volt Heated Work Gloves - Leather Work Gloves - Rechargeable battery heated gloves that will help keep your hands warm while you work in cold conditions. Those are very impressive gloves. I really should recommend those to my dad since he sometimes deals with fire and water. It seems like they would be very good for my him. I don’t know how good they are until I actually try using them, but for now the price seems quite a bit higher than other gloves. I will do more research! Thanks for the info. Yes you’re right about the price being higher than most gloves. That’s very true but these are not your average gloves. The fact that they’re heated means that you’ll never suffer frmo cold hands again. The heat really is amazing and it can save any winter day from going downhill due to being cold. I find that most people who buy heated gloves are happy to spend the extra money because they get such an amazing product that really can make your day. Just by Reading about these gloves makes me want to take a hike on the Mountains on a snowy winters day- as they say there is no bad weather just bad clothing- and hands are definitely really tough to keep warm when it´s Cold outside… well, not anymore I guess. Thanks again for a great Review! There is no bad weather just bad clothing. Wow I love that saying, thanks so much for introducing it to me. It couldn’t be more true. I always just bundle up with the right clothing and so I can go out no matter how cold it is outside. It’s amazing what an extra layer can do for your morrale when out and about. Now just imagine the soft electric heat giving you that extra boost. It’s just so nice. Are these gloves made in the USA? Are these gloves unisex and do they come in different colors? I’m assuming that these gloves are on the thicker side, so would they be good for jobs that require detailed work? These gloves are rather pricey so what would recommend for those on a budget? Thanks! No these gloves aren’t made in the USA. They also don’t come in different colors because this is the work glove but there are a lot of different colors with other gloves. Have a look Right Here for more options. Maybe you’ll find a color you prefer. Also that link will show you some cheaper options as well. These gloves are rather thick but you’d be surprised how good the dexterity is. It really just depends on what type of jobs you’re doing with them. You can always just get a thin pair of heated liners and wear them under your regular work gloves or eve on their own. Thanks a lot. Seems like an excellent choice of cold weather gear! I could of used these this past winter for sure. I am tempted to buy the gloves even thou its getting warmer around my area now. Maybe Ill be extra prepared for next winter lol. All in all, this content is very good. I read it and got informed that there is another option on the market. I was just used to doubling up gloves then letting my hands freeze! Thanks to this new information, I have a new way to combat the cold. Your welcome, I’m just glad I could help. Yes doubling up the gloves is a common practice around my neck of the woods. Most people haven’t even considered getting heated gloves because they just aren’t aware of them. I know when I first discovered them I was thrilled. i was finally able to stay out on the slopes all day no matter how cold it got. My hands were always the first things to get cold and so I would have to take constant breaks in the lodge just to keep going. Now I just stay out all day. I couldn’t be happier. I was very surprised, I didn’t know these gloves even existed. Great information. I have worked on the ramp of some very cold airports. I know airlines would not spend that kind of money on employees, but alot of workers would use these just for the comfort and warmth. I will pass this on to co-workers. Yes it’s too bad that companies aren’t willing to spend the extra money to keep employees healthy but I guess it’s understandable in some cases. There are a lot of people who would be more than willing to spend this kind of money on themselves because it can really be a game changer for people out battling the elements. Thanks for the comment. I’ve been looking for some gloves like this for a while for my boyfriend. He rides a motorbike so I suppose the bulkiness wouldn’t matter so much. The price of the gloves for 8 hours on low compares very well with others that are around $400. Thanks for your advice. You’re right that the bulkiness isn’t a huge problem when riding a motorcycle. But even so, there are specific gloves out there that are designed for riding motorcycles. The main difference is that they offer more protection in case of an accident. But on top of the protection they do offer a little more dexterity so that you can have more control with things like shifting gears, braking or other controls. If you want to see more of the specialized heated motorcycle gear click this link and you’ll be able to see a lot of great options. There is a lot of great detailed information here. The Volt 7.4V Heated Work Gloves look to be a great pair of gloves. If you have to turn them down when its -4? I’m sold! If this glove has such a good rating for warmth but not dexterity, what would you recommend that would be more in the middle? One that has good warmth and good dexterity? Thanks for your kind words and for your question. If you’re looking for a good pair of heated gloves that is more well rounded then you’d probably be best to try the Volt Tatra. That would be a great all round glove that you can wear for most activities. With that being said, you won’t want to wear these for heavy duty work like with the Heated Work Gloves in this review. If it is work gloves you’re looking for but you just want more dexterity then I would recommend you just buy a pair of thin heated glove liners. A lot of people just use heated glove liners and wear them underneath their regular work gloves. Sure you won’t have the exact same dexterity as you would without them on, but the warmth will be amazing and you should still have great dexterity. I hope that helps. Hey, nice website about gloves. I really liked the glove review page, and I am surprised to know that there are heated gloves out there. Unfortunately I don’t live in the super cold places, where I would need those kind of gloves. Don’t you think 196$ is pretty expensive for a pair of gloves, heated or not. It is just my opinion. Thanks for the comment. Yes I agree that this is a lot of money to spend on gloves. What you need to remember is that this is a niche market. People who are buying these gloves are having serious problems with cold hands to the point that it is really affecting their day or life. These types of people are more than willing to spend the extra money to solve this problem. Some of these people work outdoors in a very extreme climate and some of them have conditions or diseases like Raynaud’s or arthritis. When you have problems like this, $200 is a small price to pay to improve your day to day life. I think these gloves are exactly what I’ve been looking for. I work on road maintenance and so I work outside in all weathers (British weather) and I promised myself I would not go through another winter like the one we’ve just had. There’s nothing worse than being red, cold and numb – it makes for a really long work day. Yeah I agree with some of the other comments, they are a bit pricey but the way I see it is they are a good investment and they’re definitely worth if if this review is anything to go by. Thank you so much for reviewing these – it’s good to get good, honest feedback and after reading this I’ve just ordered a pair. These gloves really will change my working day. Thanks again. I’m glad you found it helpful. You’re right that it’s worth the money. Obviously these would be too expensive if you live somewhere where it only snows once a year. But these gloves are for people who are outside battling the extreme cold temperatures on a regular basis. Asside from that, there are people who suffer from legitimate conditions that cause chronic cold hands. For these people, this is a small price to pay to solve their problem. heated gloves – what a great invention! I haven´t known that it already existed. I tend to freeze and these gloves will definitely improve my winter feelings and my ability to work outside. Before buying some gloves, I will check all your great and detailed reviews. I’m glad you found this helpful. Please let me know if you have any questions in your search for heated gloves. I’m always glad to help. Hi there, you have provided a very in depth review of the warmest gloves. I have never considered such a product. My husband works on extremely high buildings and mostly works in the very cold winter, These gloves would be great. I like that you can adjust the heat and that the battery last for quite a few hours. What type of batteries are used? is it expensive to keep them going for 5-6 days a week? The batteries are a lithium-ion rechargeable. They last quite a while and they are very reliable. Not all that different from what we all have in our smart phones actually. I work in some pretty extreme conditions repairing water mains. How do you think that these gloves will hold up with a lot of manual hand digging, the use of wrenches and hand tools and being around A LOT of water. From the sounds of it your job is very hard on gloves. Juts to be safe I think you should instead get some heated glove liners and wear them underneath your regular work gloves. Not saying that these won’t hold I’m just saying that liners are probably a smarter option for your circumstance.